Alvin Clarence Thomas, one of America’s finest ever con-artists, gamblers, tricksters and hustlers, diddled countless folk out of very large sums of money. He also lost several fortunes over the span of his somewhat shady ‘career’ but, more often than not, ‘Titanic Thompson’ would walk away from the poker room, pool table, bowling alley, or golf course with a grin on his face and a wad of hundreds in his pocket. Thompson (the name stuck after a newspaper misspelled his actual name) made a good chunk of his winnings playing golf to a standard both Byron Nelson and Ben Hogan said would have assured him of success on the PGA Tour. But the tall man with the blank face from Arkansas wasn’t interested in playing for $500 at the Tam O’Shanter Open. That wasn’t his style. He much preferred going up against a young, heavily-backed assistant pro for $10,000 or more (usually put up by members of the country club the pro worked at), or taking on the best-ball of four single digit golfers with 25 grand on the line. Thompson isn’t the subject of Terry Jastrow’s new movie ‘The Squeeze’, but it’s safe to suggest his life provided much of the inspiration for this hugely entertaining tale that follows a young and talented golfer named Augie Baccas (played by Jeremy Sumpter) who grows up in a small, rural town where he wins the city championship by 15 shots. A dapper Southern gentleman who goes by ‘Riverboat’ (Chris Macdonald, aka Shooter Mcgavin in Happy Gilmore) is en route from Mississippi to Las Vegas with his wife Jessie (Katherine LaNasa) who has a pseudonym of her own – ‘The Bank’ because it’s her that collects Riverboat’s often ill-gotten gains – when news of Augie’s impressive victory comes over the car radio. Sensing a money-making scheme, Riverboat swings his T-Bird off the freeway and goes in search of his golden goose. Augie can't say no to Riverboat's cash. With the promise of big paydays, Riverboat lures Augie away from his dreams of qualifying for the US Open, and the house-painting and golf shop-tending jobs he keeps to help his mom pay the bills and buy stuff for his younger sister on whom he dotes. His girlfriend Natalie (Jillian Murray) does her best to convince Augie the path he’s choosing will only lead to ruin, but the smooth-talking Riverboat is hard to turn down and, as the money begins rolling in, Augie is convinced he did the right thing. Of course, Riverboat has much bigger plans than the $2,000 bets he collects in Podunk southern towns. He wants to take Augie to Vegas where he can tee it up against big players with considerably deeper pockets. In a Sin City hotel room, Riverboat wins big at the poker table in a scene casino-owner Steve Wynn has described as the best poker scene he ever saw. 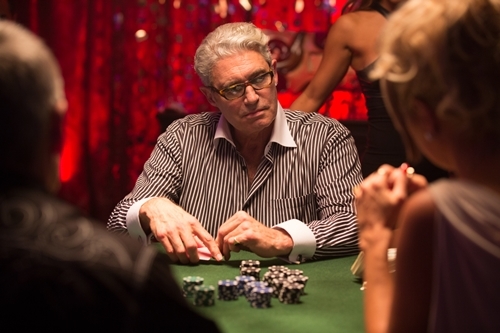 Riverboat takes the sinister Jimmy Diamonds (Michael Nouri) for about $900,000 and proposes a big-money golf match as an opportunity for Diamonds to win back what he lost. Each man can pick his player. Riverboat chooses Augie while Diamonds, eager for the return of his money and keen to teach this fancy Dan a lesson, selects Aaron Bolt (Jason Dohring), winner of the recent American Amateur Championship. But picking the best amateur in the game isn’t enough security for Diamonds who finds Augie in his hotel room and threatens to kill him if he doesn’t lose. Augie, whose dream of playing golf for guaranteed money and providing for his family has come crashing to the ground, tries to skip town. But Riverboat is at the bus station to stop him going anywhere, and issues his own terms – lose and he dies. It seems Augie is a dead man, whatever the result. Don't mess with Jimmy Diamonds. The Squeeze is a terrific yarn inspired by Titanic Thompson’s exploits and based on actual events that happened to a young Keith Flatt, a former assistant pro who earned $518 a month in the pro shop but was offered $1,000 a month plus sweeteners to play golf by a group of men who instructed him not to join any mini-tours or play any big-time events so he could remain largely unknown. Flatt, who after two years of significant success was asked to enter into bets he wasn’t comfortable with, eventually got out of his own predicament by way of a hoax family emergency. He is now married to the vice president of hotel sales and marketing for Wynn Las Vegas and told Jastrow, a friend, his story over dinner one night in 2008. “That sounds like a movie,” said Jastrow who ironically had Flatt play the part of a hustler in the film. Jastrow, a veteran TV producer with seven Emmy awards and 17 nominations, has directed or produced 68 of golf’s major championships and worked at numerous other big sporting events including six Olympic Games. His script is full of tension, humor, intrigue and wit, and he unequivocally succeeds in his quest to make the Squeeze what he calls a ‘popcorn movie – a real caper that people can sit down and enjoy without having to think too hard’. Sumpter, a big Phil Mickelson, Jordan Spieth and Kobe Bryant fan, and +1 handicap who plays his golf at Moor Park CC 40 miles northwest of Hollywood, beat over 1,000 other candidates for the role and says he was born to play Augie, just like he felt he was made for the part of Peter Pan in P.J. Hogan’s 2003 adaptation of J.M. Barrie’s classic children’s tale. Having whittled down the would-be Augies to three finalists, Jastrow had them join him for a round at Bel-Air CC where he is a member. “It was very important for me that Augie be a legitimate golfer,” says Jastrow. “Sports movies lose a lot of credibility when the lead actor can’t play the sport the movie is about.” When Sumpter hit his opening drive over 300 yards, then followed that with a series of beautiful shots over the next few holes, Jastrow knew he had his man. “He put it beyond doubt when he bet me he could put it on the green from 110 yards out using his putter, and did,” adds Jastrow. 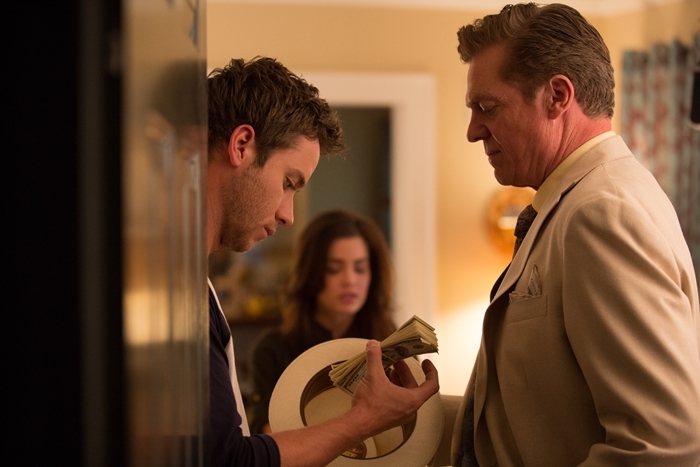 The Squeeze, co-produced by Jastrow’s wife Anne Archer and made for roughly $6m, differs from most golf movies in that the central character can really play the game. It also differs from most other golf movies - Caddyshack, Greatest Game Ever Played, and Happy Gilmore the exceptions – because it’s really good. 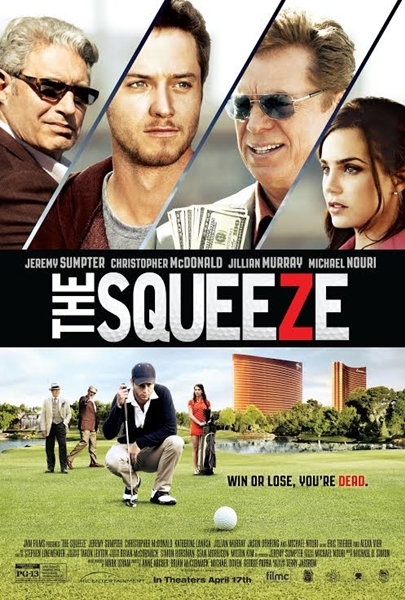 The Squeeze opens in select cinemas on April 17th when it will also be available on Video On-Demand and iTunes. Groupon will be offering it as a digital download, and it will be released on DVD on June 9th.